Over the past few years, Local Search has been gaining momentum. More and more small business owners seek to rank higher in Google Places, especially now, as search results personalization is at large and growing. Point is, we are now seeing an increasing number of Google Places results displayed above Google’s Everything results, which, for some businesses, means virtually no chance to get noticed unless they hit top Local Search listings. Are there any specific steps one should take to rank high on Google Places? Sure there are. And if you have so far not thought seriously of the Local Search, it’s probably time you do. Geo terms are not allowed in the Category field either. Your location is self-evident, judging by the address that you specify, so, there is no need to emphasize it in your Category. Otherwise, Google might consider it spammy. All in all, you can add up to 5 categories per listing. For marketing analytics purposes, you might want to use different phone numbers for different online resources that mention your business. This is quite understandable, but, for Local Search purposes, it’s best to stick to one main, NON-1-800 phone number. The best practice is to always use one real, geographically-marked phone number for your business. Do not use PO Boxes to add more business listings. 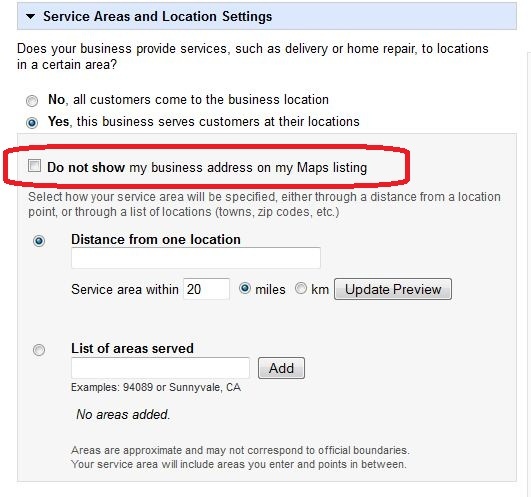 If your business has more than one location, go to the “Service Areas and Location Settings” and specify your service area. What’s interesting about this section is that it can be used to hide your business address from the users in case your business presupposes visiting clients instead of them coming to you, and you don’t have an office as such. In which case you can set your home address as your main address, specify your service area and choose to hide your address from everybody on the Web. It will still be visible to Google, though. NAP (Name, Address and Phone) is a popular Local Search marketing acronym. This is because keeping your NAP uniform across numerous mentions of your business on the Internet is key to the success of your Local Search campaign. Some Local Search marketers say that your URL associated with your company’s NAP should always be the same, and use the NAP+W (website) acronym instead. Google aggregates data from multiple directories and other online sources to evaluate the users’ sentiment for your business. So, if some of that name-address-phone info provided is inconsistent, Google may deem your business untrustworthy. When you create a business listing on Google Places, you can also attach images/videos to it. Make sure the visual materials that you attach contain keywords in their meta data. Once you create a business listing on Google Places, your goal is to make it more popular than those of your competitors’. 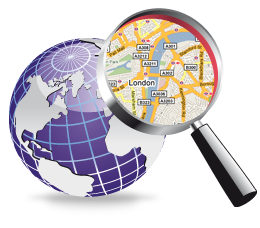 Google ranks listings in Local Search results based on their relevance, distance and prominence. Relevance and distance are pretty easy-to-grasp criteria. Now, what about prominence? As applied to Google Places, prominence is how popular a business is with online users, in other words, how well-established it is. According to Google, it is “based on information we have about a business from across the Web (like links, articles, and directories)”. So, to start with, try to list your business in the regional sections of such online directories like DMOZ, Yahoo, and BOTW. 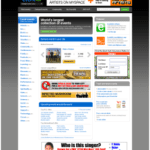 Then, get listed in authoritative data providers and Internet Yellow Pages like Yelp, Superpages, Citysearch, Yellowpages, Infogroup, Yahoo Local, Localeze, InsiderPages. Look for niche-specific directories and review sites, for example, Zagat and OpenTable for the restaurant business, etc. Remember to use the same Name-Address-Phone (NAP) in all your listings! Some marketers say it helps to include locally-marked keywords in your main site’s page titles. For example, instead of calling your webpage “Dos Amigos Hotel – Cheap Hotel Rooms”, call it “Dos Amigos Hotel Galapagos – Cheap Accommodation in Galapagos”. Until recently, Google displayed third-party review snippets on Google Places alongside Google’s own reviews. Then, after complaints from such sites as Yelp.Com and TripAdvisor.Com, Google removed all non-Google review snippets from its Local Search listings. It now only displays links to sites where more reviews can be found in its “reviews from around the World” section. So, it can be said that Google still aggregates mentions (so-called citations) from other, non-Google sources. But it is hard to tell how important those citations are for your Local Search rankings. There are certain ways to encourage your users to leave reviews on Google. You can put the request up on your website, mention it in your business card, include a line in your restaurant’s check, etc. Good old link building still plays an important part in boosting your Local SERPs positions. If you think that Google will not associate your Local Search listing with your main money site, think again. 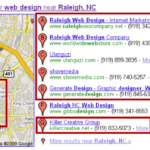 Besides, most business owners specify their main site while creating a Google Places listing. It should be mentioned, however, that if you decide to create several listings for your business, it’s best not to use different domains for them, but use a subdomain or a Web 2.0 property, so that the SEO value of your main domain gets passed on. And, finally, besides utilizing the Local Search optimization tips provided here, use “regular” SEO techniques that improve your main site’s rankings – that’ll boost your Google Places positions, too. How is Google Ranking the Local 7-Pack Listings?